Using my new cutting board!Today Rachel (my cousin) and I discovered an amazing sale at Joann Fabrics! After a considerable amount of walking around and trying to figure out what to buy, we found a pattern that will be my first sewing project. One of the employees was very helpful and showed us what we needed to buy for the pattern. I also found a cardboard foldable cutting board for 50% off, yeah deals! We came home and began deciphering the supposedly "easy" directions. 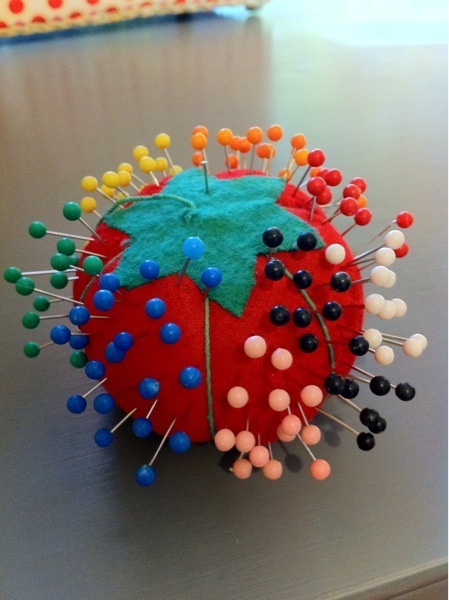 Rachel put all of the sewing pins on a pin cushion, organized by color, on her own initiative- something I totally would have done! After reading the directions, we cut out the pieces of pattern paper required for our pattern & laid out the fabric. We then pinned the pattern paper to the fabric taking note of the directions on the individual pieces. Some pieces need to be pinned to the folded edge, others need two of each piece, yet others a choice must be made for the size you choose (specifically apparel). We haven't actually cut the fabric, pizza was calling our names! Maybe it's because I haven't used a pattern in at least 15 years or is it just me that this part of sewing is very challenging?